I love the summer as much as the next gal but, if you're a make-up enthusiast, autumn has suddenly started to look up! "Go big or go home", says Lori Taylor, Global Pro Lead Artist with Smashbox. "Big heels, big hair, more makeup - that's my philosophy!" Lori was showcasing the brand's new Fade to Black collection, which hits counters at the end of the month. Small but perfectly formed, it includes two each of eyeshadow palettes, lipsticks and waterproof shadow liners. "Summer is all about being natural", Lori told us. "But when it comes to autumn, it's time to really start wearing your makeup again. To be current and modern next season, eyes and lips are where it's at." 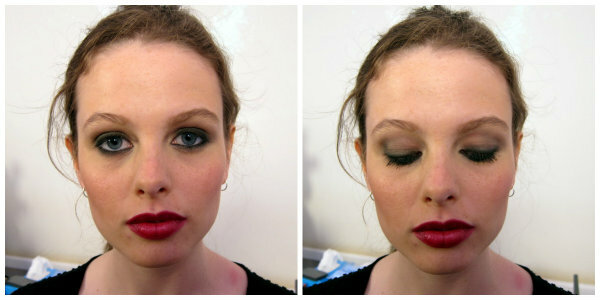 Fade to Black is all about lived in, sultry, smoky eyes, teamed with a strong lip. Choose from khaki or purple themed eye palettes - both €39.50 for seven shades - worn with the new rich, creamy Waterproof Shadow Liners in Black Gold or Blackest Black (both €19). The shadows are stunning: from mattes to shimmers, you have everything you need in one gorgeous metallic purple case, in a colour palette ranging from neutral to deep and intense. For lips, choose from Be Legendary lipstick in Cognac, a bronzey rose, or Black Cherry - my personal favourite, a deep burgundy. Creamy and comfortable to wear, these are also €19 and encased in a pretty metallic purple case. Other exciting new launches from the brand include Liquid Halo Foundation, an oil free formula with a beautiful gel-like texture and a finish that works with skin's natural undertones. A gorgeous new range of Be Sharp eyeliners will replace the existing line, while the Blemish Control primer brings the brand's primer offerings to 13! They're made to be layered, so don't be afraid to mix them up - I've been wearing the hydrating primer under the luminising version, and loving the results. As you might expect of a brand with this heritage – it was born out of Smashbox Studios in LA – all of the makeup photographs beautifully. And you can test that claim at the seriously swish Smashbox counter in Arnotts, which features a photo booth so you can see the products in action, and share the pics to your social media channels. Impressive, huh? Swatches and reviews will be on the blog shortly but in the meantime, is anything piquing your interest from this lovely little lot? Dying to try Black Cherry! The colors are so stunning. I love Smashbox's primers. Awesome! Loving their philosophy! Big hair, big heels, big make up - words to live by I reckon! Sera you'll love it - such a great brand, the textures and formulas of everything I've tried has been stellar. Oh wow, that dark lipstick looks amazing! I love autumn colours! I can't wait to get a closer look at these! I'm definitely curious about Liquid Halo - perhaps i'll have to check it out! Pretty makeup - love the bold lip color! Looks very appealing! Would love to try the foundation and the lipsticks! I have never tried Smashbox cosmetics before, but want to buy their primer and eye shadow after a lot of great reviews recently! Hope you are having a wonderful day! Eyes AND lips? This goes against everything you taught us Emma! Dark lips for the win!! Emma I love the look of that purple eyeshadow palette, I love doing a purple smoky eye on a might out! I know some people aren't mad about the dark eyes and bold lips combo, but I really love it when it's done well and not too OTT. I've actually never tried Smashbox before so this has certainly inspired me to! Hope you had a lovely weekend and got to enjoy that weather! What a fun event! Looks like a gorgeous collection! I'm intrigued by the Black Gold Shadow Liner. Love it! This is a great collection that must not be ignored. Love the colors and shades. OMG! I wish I can have them fast!! I'm so afraid of doing eyes and lips, not sure I can!! Lovely range though!